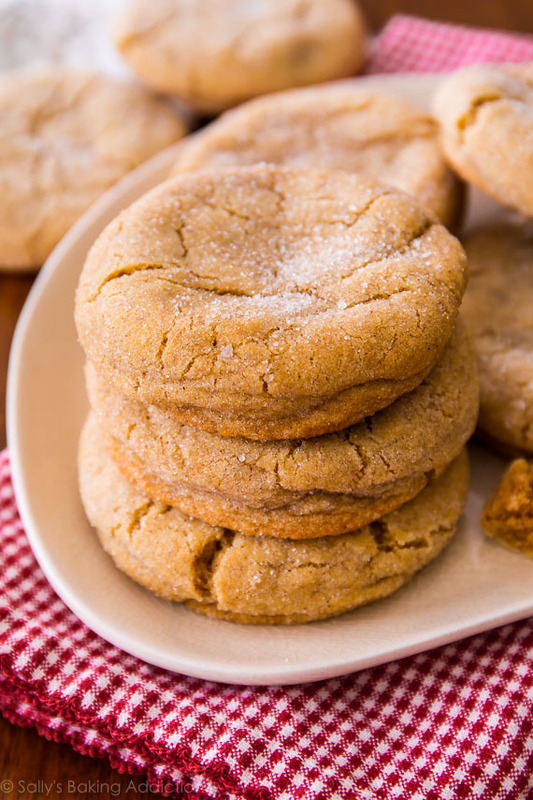 Super soft and chewy brown sugar cookies - no mixer required! Toss together the flour, baking soda, cornstarch, cinnamon, and salt in a large bowl. Set aside. In a medium size bowl, whisk the melted butter and brown sugar together until no brown sugar lumps remain. Whisk in the egg. Finally, whisk in the vanilla. Pour the wet ingredients into the dry ingredients and mix together with a large spoon or rubber spatula. The dough will be very soft, yet thick. Cover the dough and chill for 2 hours, or up to 3 days. Chilling is mandatory. Take the dough out of the refrigerator and allow to slightly soften at room temperature for 10 minutes if you had it chilling for more than 2 hours. Preheat the oven to 325F degrees. Line two large baking sheets with parchment paper or silicone baking mats. Set aside. Pour the granulated sugar into a bowl. Take 2 Tablespoons of dough and roll into a ball, then roll into the sugar. Bake for precisely 8-9 minutes. Remove from the oven and gently press the top of the cookie down with the back of a utensil or even use your fingers. You're trying to obtain a crinkly top. Place back into the oven for 1-2 more minutes. Cookies will be puffy and still appear very soft in the middle. That's ok. Remove from the oven and allow to cool on the baking sheet for ten minutes before transferring to a wire rack to cool completely. Cookies stay soft and fresh for 7 whole days at room temperature. Cookies may be frozen up to 3 months. Rolled cookie dough may be frozen up to three months and baked in their frozen state for 13 minutes.